Old-school suit coats from the early 20th century consisted of “structural” features like shoulder pads, heavy linings and chest canvases. They were seen as the key characteristics of a “power suit,” until they were phased out for the casual styles of the ’70s and beyond. Today, custom tailoring is experiencing a resurgence, but professional jackets are getting a modern makeover. Read on to find out what makes an unstructured jacket unstructured. 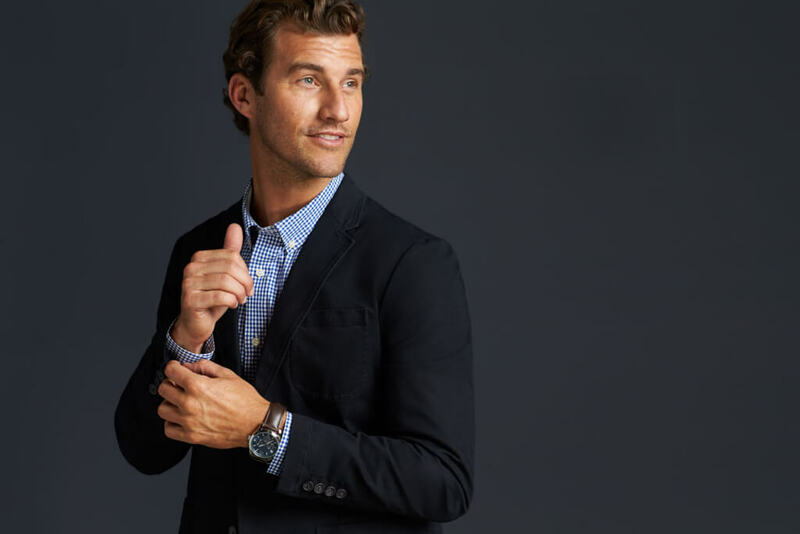 While the lining of a suit coat hasn’t been made completely redundant, an unstructured jacket features only a little lining, strategically placed at the upper back and shoulder. This gives the jacket shape, but makes it easy to slide on and off. Why on Earth do you need canvas under the chest of your blazer? It keeps the fabric wrinkle-free, molds to your body shape over time, and adds a little weight to the jacket. Unstructured coats don’t forego this crucial feature, but they typically have lighter, more flexible fabric to take away the heft most structured jackets have. So, now you know the difference. But what are the benefits of choosing an unstructured jacket? They’re lightweight & easy to pack for business trips. They mold to your natural body shape & come in slimmer cuts. You won’t overheat in them.